When local churches are sold or demolished by outside authorities there is always local opposition. It is stronger when the local community does not believe it has been consulted. And the conflict is especially bitter when a village church is sold by a town congregation. A recent book about the struggle to save a Victorian Western District church from decommissioning and alienation illustrates what is at stake. 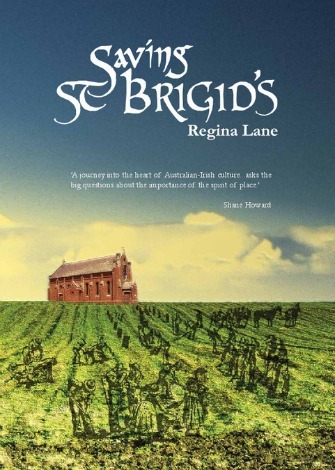 In Saving St Brigid's Regina Lane tells the story from the point of view of those who fought to save St Brigid's Catholic Church in Crossley for the local community. Its members are descendants of the Irish immigrants who over generations built and supported the church. It has been the heart of their community. The conflict began with falling church attendances and a decision by the Koroit parish priest to rationalise resources. This involved decommissioning the Crossley church, a decision taken without proper consultation of the Crossley community. This led to representations and abrupt rebuff, appeals to the Bishop, promises not kept, the formation of a Save St Brigid's group, local and national publicity, the placing of the church on the market, and almost miraculously the purchase at market value by the group as a community centre. Although the book describes in detail the battles to save the church, it is far more than a protest song against the power of the Catholic Church. It is really a passionate celebration of the community built by Irish potato farmers who fled famine in Ireland, and of the church at its centre. Standing on red volcanic soil and looking towards the pines of distant Port Fairy the church evokes a richly peopled land, its ties with Indigenous Australia and with Ireland, and the precious gift its power to connect people is to a more individually focused age. Above all Lane invites the reader into her own journey. It takes her from a country life lived in the shadow of St Brigid's to the city where she seeks to find her place in a broader world, working in social organisations in Australia and overseas. When she committed herself to save St Brigid's she found herself building personal and community identity out of apparently inadequate materials. At the book's end she is able to own in her own way the values of family and community she had earlier found constricting. She gives herself so generously in her writing that her book becomes a love story, touching all the moments of self-doubt, of ecstasy, of despair, of friendship, of the transfiguration of faces and places, and of exacting ordinariness that are the grammar of love. For a Catholic reader the charm and sadness of the book lie in the fact that she could enter imaginatively the heart of Catholic life only by rejecting the values she saw in the Catholic Church she had to deal with. So why did it have to come to this? Simply, the protagonists on each side of the dispute, many of whom I know and respect deeply, had different understandings of church buildings. One side saw them as church property for which the local priest is responsible to administer for the good of stakeholders. These are the Catholics currently involved in parish life. The other side saw church building as a living centre of the relationships between time and space that shape the community. The community extends far beyond the boundaries of practising Catholics to embrace those for whom the church is part of their identity. These views of church buildings are complementary, but in conflict were seen as incompatible. It was then easily forgotten that the relationship of churches to the families that compose the local community and their history in the district is fundamental to understanding the church. Their importance is implied in the belief in the communion of saints, a much neglected phrase in the Creed. In the communion of saints, which links Christians who have lived with those still living, bodily connections are important. The people who have built their local church, prayed in it all their lives and cared for it, matter. Their associations with place and community, through the church hall that was the centre of social life, the stained glass windows that coloured their childhood, matter. The larger stories embodied there, the immigrant groups who formed the first congregation and their relationship to the first Australians, have continuing importance. Nor is the communion of saints confined to the virtuous and church-going. It comprises all the baptised, and reaches out to many others. It includes the 'church dormant': tribal catholics whose families belonged to a congregation, and who may attend church occasionally for baptisms, marriages, funerals, and major feast days. Because these concrete relationships to church buildings matter, Catholics in a parish composed of a central church and outlying congregations are not simply individuals in a homogeneous group. When they meet they carry their local connections with them. Had the importance of place and history been given their proper religious value, the community would have been consulted in depth and the fight would not have become so personal. Perhaps the parish may then have seen the outcome of the struggle — the development of church property as a community centre — as central to its own outreach to the wider community. But in that case the energies that inspired a community to fight for the church and led to so much self-discovery may not have been released. Ultimately, like Adam's biting the apple, the actions that precipitated the saving of the church may have been a happy fault. This is a deeply resonant article from Andrew. In small, isolated communities schools, churches and libraries are essential to the health and well-being of community members. In a large city the story is the same, and different. The other day I was taking a walk in the late afternoon when I found on the ground, near a school bus stop, a school library book - probably fallen from a schoolbag a little earlier. I picked it up and returned it to the school, a small gesture but important to me and to the school. My church in our community matters - not just to those of us who attend but to all people in the district and visitors. Not as a community centre but as a church. That's our outreach. This small but evocative sketch illustrates several important issues, issues fundamental to the notion of who we are. It is about “connections”. Connections to Irish ancestry, connections to earth, connections to that spirit that for years inspired the Irish church, a spirit now in great need of nourishment. Buildings and place remain central links in restoring those communal links so essential to our memory of whence we came and who we are today. It has resonance far beyond Koroit. God has evidently decreed that life should be evolutionary. What is past is important, but what is very much more important is Future Development. A baby's life is immersed in baby things and baby 'ideas'. These must be outgrown for the baby to become firstly a child, and finally an adult. Looking backwards or over- valuing 'Traditions' can stultify progress. The most important Tradition is the one we are (hopefully?) about to construct as we adapt to the new situations that are evolving around us. We need to preserve the Spirit, but shed the material props that were useful, even necessary, in the past, but which need to evolve or be replaced, to prepare us for the future. Out-dated Traditions are obstacles in our path unless they can inspire us to gain a Vision for the Future. From my experience of small country parishes the local church building is much more than a denominational institution it is a symbol of the continuing life of the local community. The church is actually the assembly of people, the ekklesia, and can exist whether the building is there or not. Robert Liddy,"Out-dated Traditions are obstacles in our path unless they can inspire us to gain a Vision for the Future". Would you be kind enough to help me understand this statement. What are these outdated traditions? By what measures are these traditions out-dated? What are or were the useful and sometimes necessary "material props" in the past which need to evolve to prepare us for the future? This is a genuine enquiry - not a comment. I do not view, for instance , the spirit of Fr Hamilton's article as something of a prop from a past tradition. A very heart-warming and thoughtful article with wider significance. I think, for example, of St David's, Landilo, sold by the (Anglican) Diocese of Sydney but eventually re-bought by the community and now again in use for a Sunday service. More sadly, I think of the historic St Thomas' pioneer parish cemetery at Narellan, sold (!!) to an undertaker for $90,000 and sold by him to the Muslims for $2 million. At least access to the old graves is, of course, still permitted! St. Brigid's history and the campaign to save the church have resonance in Canada as well. Andrew Hamilton's articulation of the meaning of the church to the community, and of its potential role in bringing the two together where they have separated is important and very well done. Over some years, many have mentioned that the reason they have gravitated to another denomination and/or religious group is the lack of feeling that they belong. Anybody with ears has heard that. Highlights the sense of belonging that we all crave in some sense or another, and the significance of physical centres where the opportunity to be part of community holds a tenuous thread. Not restricted to country locations either. In Melbourne's inner East a parish was recently subsumed into another more vibrant parish, next door, which had enjoyed a new vitality due to the personal pov of the PP that the parish is a community and that the assets of that community were for the furtherance of community. Presbytery became the Parish Centre. The new PP palpably didn't share this pov, and was employed by the Archdiocese to conduct a feasibility study into the viability of maintaining the primary school at the old parish. Parents that poured their hearts and souls into that school community and into the community of school were hurt and dumbfounded by a process of 'consultation' using data manufactured by hierarchical decisions implemented by a school principal that saw escalating school numbers in a hot suburb for upwardly mobile young families, plummet to unsustainable numbers. Reckon a setup? Lots more could be said, however this type of scenario has probably played out forever, and will continue to do so, quite simply because it's easier to pre-calculate direction with monopoly money than to engage in building and/or rebuilding a community of souls. I wonder - if Vatican II had played out, would Andrew Hamilton have as many souls mulling over this subject? Thank you for that story about the church and the book by Regina Lane "Saving St Brigid's". You have summarised the points about the human connections to the history of our forebears and the life of our families so well. The link to the Communiion of Saints particularly appeals in the clarity of your comments. I do so wish the Nicene Creed picked up this important part of belief. i usually manage to add that when the creed is being said.